We are a volunteer operated Museum, and do not have enough volunteers and resources to be open on weekends at the present time. Everyone in your group must come to the VISITOR CENTER to sign in. Every visitor will be required to sign a Participant Release Form where you indemnify Train Mountain in exchange for being able to use the facilities and property. You also acknowledge the existance of an inherent risk in Train Mountain activities, and that you will insure the acceptable personal behavior of yourself and any minor children listed on your release form. Each person in the party will then receive a Train Mountain Tour Badge that is to be worn at all times you are on Museum property. Please leave these badges at the VISITOR CENTER when you leave. This is an interactive learning opportunity designed for adults and older children with sufficient maturity to benefit from this educational experience. Rail Tours are only available when the weather conditions are appropriate and we have Volunteer Tour Docents available to give the tour. 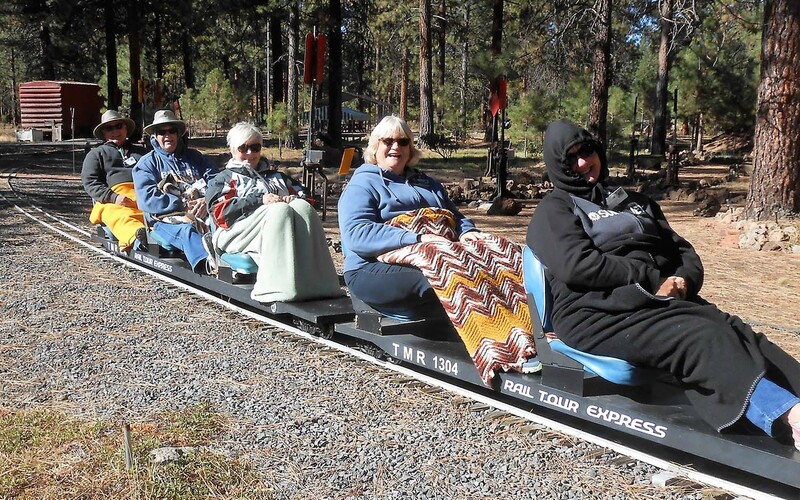 We do NOT guarantee drop-in visitors will get a Rail Tour. However, if you call ahead and make a reservation, we will do everything in our power to make sure your group will get a tour. 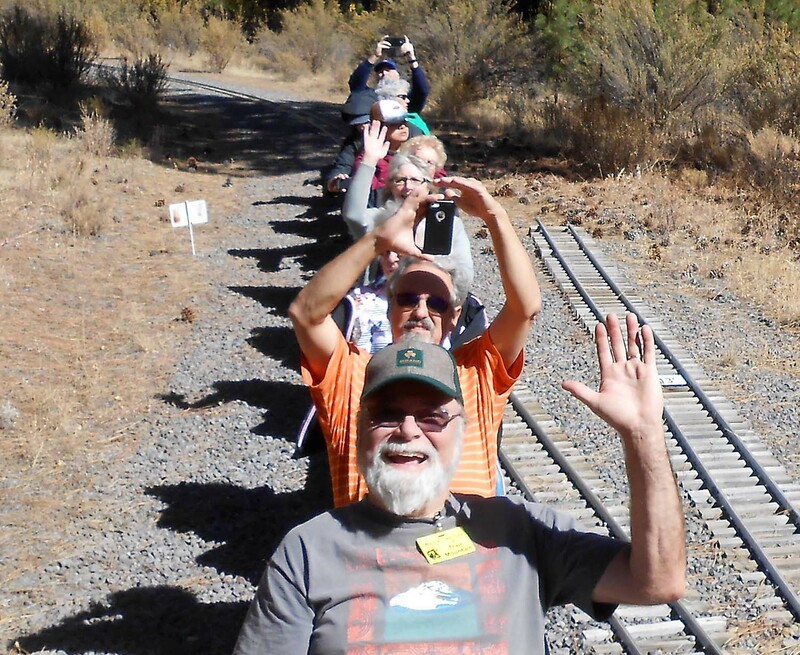 For More information or Tour Reservations please call Train Mountain at (541) 783-3030 during regular visitor hours. At the present time, we do NOT have prepared food for sale at Train Mountain. We do have a small assortment of vending machine snacks and beverages available. The Museum Tours are outdoors, and weather conditions can change rapidly. At a 4200' elevation, a daily temperature swing of 50 degrees F. is not unusual. You may need a warm jacket, hat, and gloves in the morning, and to protect yourself from a sunburn in the afternoon. Don't forget your camera! Main Enterance. This is where you turn in from South Chiloquin Road. There are indoor restrooms at Central Station, and Porta Potties for outdoor locations. 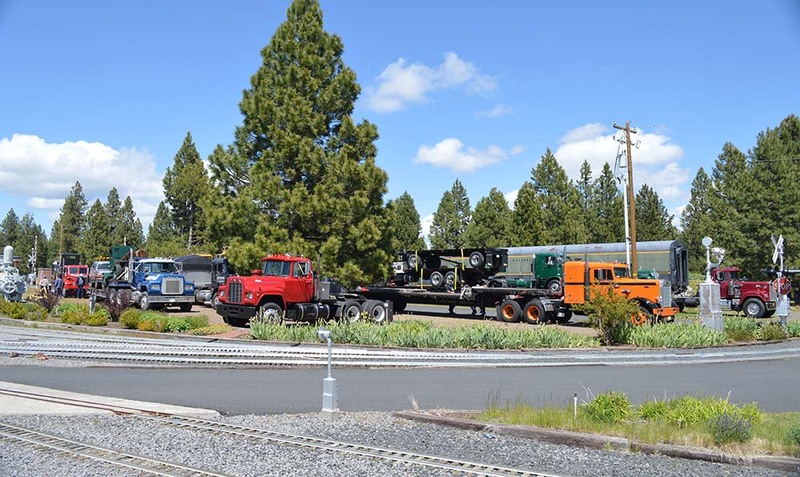 GETTING HERE - Train Mountain is approximately 26 miles north of Klamath Falls, Oregon, at 36941 South Chiloquin Road, a road that runs between Hwys 62 and 97, near Chiloquin, OR. TM is located east of HWY 62, and west of Hwy 97. The State's brown highway signs are located at each intersection directing visitors to the Train Mountain Railroad Museum. BE PREPARED - Make sure you are prepared for all possible weather conditions, and have sun screen, sunglasses, a hat, insect repellant, any medication you may require, and water. You will need to wear closed-toed shoes to take a Train Tour. NO flip-flops or sandals on the trains. 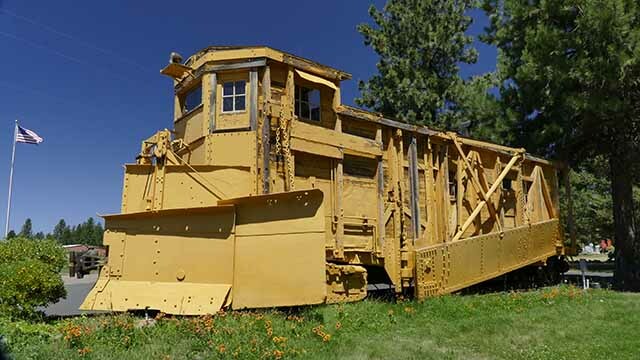 FREE - Train Mountain does not charge admission to visit the Museum, but we are a 501c3, non profit organization, and we do apprecialte donations because they help us keep the Museum open to the public. VISITOR CENTER - Train Mountain requires all Visitors to first check in at the VISITOR CENTER. FACILITIES - Train Mountain Has a Gift Shop featuring railroad themed items and souviners, like our Penny Smasher Machine with four different images. 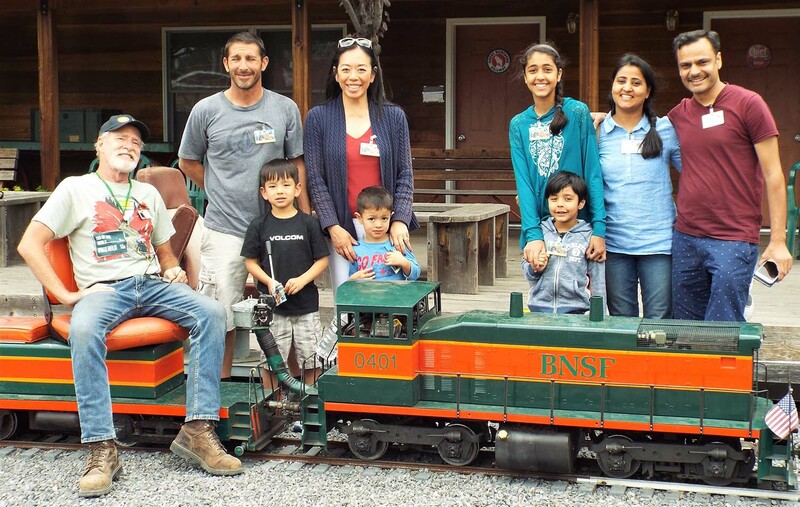 HOURS - The Train Mountain railroad Museum is open to visitors on weekdays from 9 am to 3 pm during our Summer schedule (April through October), and from 10 am to 2 pm during our Winter Sehedule (November through March). WEEKDAYS ONLY - Presently, Train Mountain is closed to visitors on weekends and holidays. 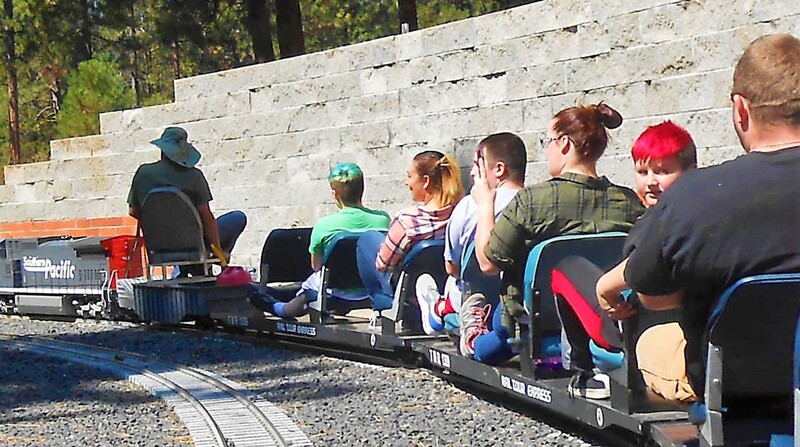 However, during the Summer Klamath & Western Railroad does offer Train Rides on Saturdays at their facility on Train Mountain. See their section below for more information. 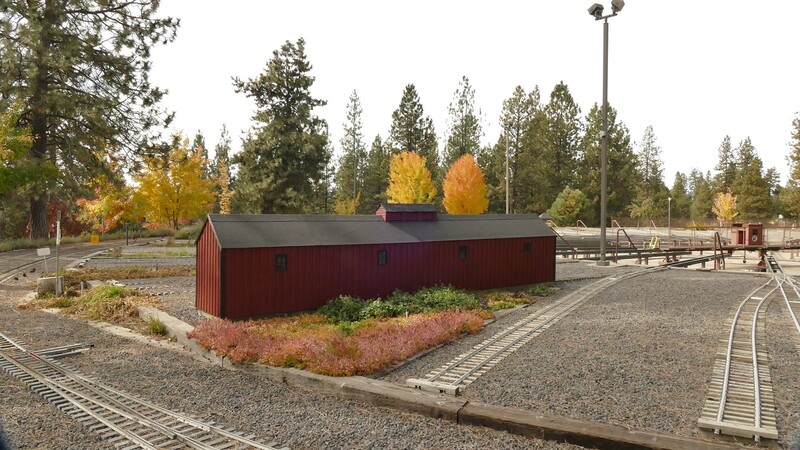 WALKING TOUR - The Train Mountain Railroad Museum offers a self guided walking tour of both full size and miniature railroad equipment during the hours listed above. Click on links above for more info. PICNIC AREAS - You may bring and eat a picnic lunch at Train Mountain. PLAYGROUND - Train Mountain has a playground for young children at the "Six Acre" picnic area. EDUCATIONAL RAIL TOURS - are also offered when the weather is appropriate, and there are volunteer Museum Docents available to give these tours. The Rail Tours run between 40 minutes and 1.5 hours, and are not appropriate for any children that have short attention spans. TOUR RESERVATIONS - Call ahead to check on available tours, and make a tour reservation. If you are looking for TRAIN RIDES for small children, this is where you want to go! Please note that the K&W parking lot entrance is approximately 100 feet east of the Train Mountain Main Entrance on South Chiloquin Road. Park your vehicle and then follow the signs to walk to the K&W train rides. 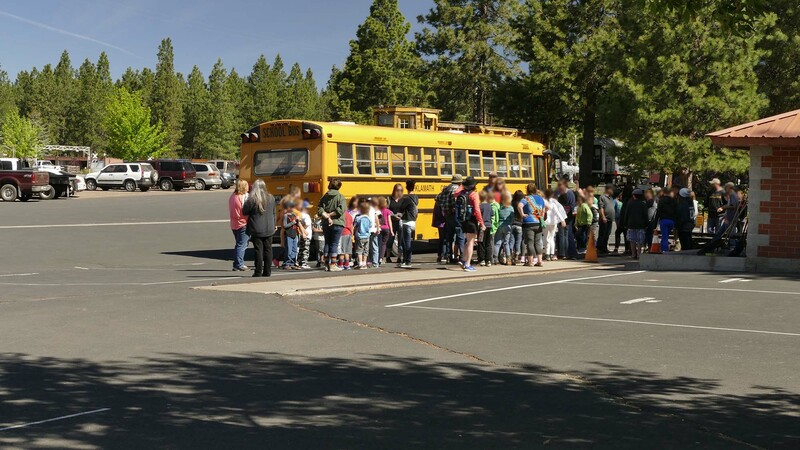 Both Train Mountain and Klamath & Western host events for groups. 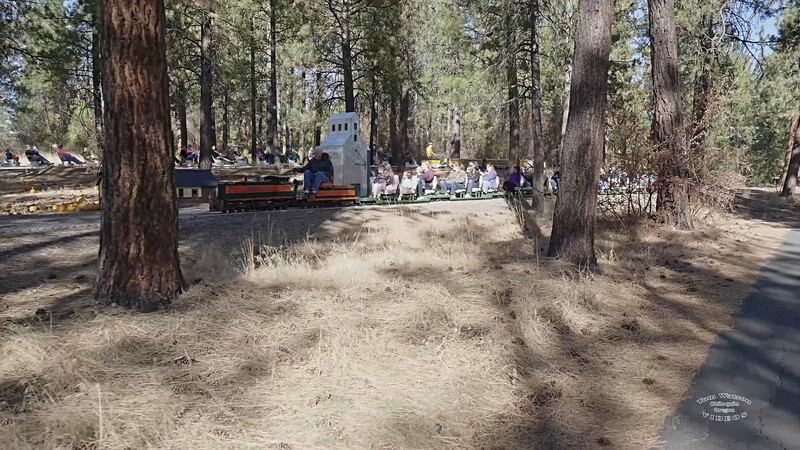 The Train Mountain Railroad Museum hosts educational tours that teach how full size railroads operate by demonstrating the operation on our miniature railroad. These have been popular with school groups. 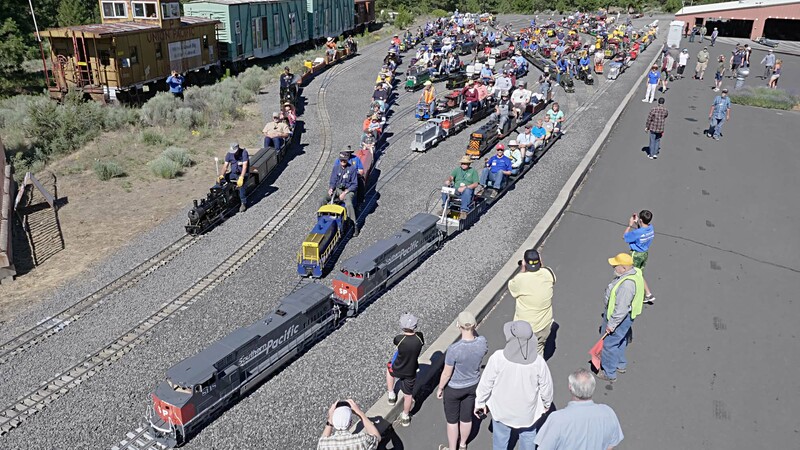 Please contact the Train Mountain Office for more information if you wish to hold an event at Train Mountain, or Klamath & Western if you wish to schedule an event there. 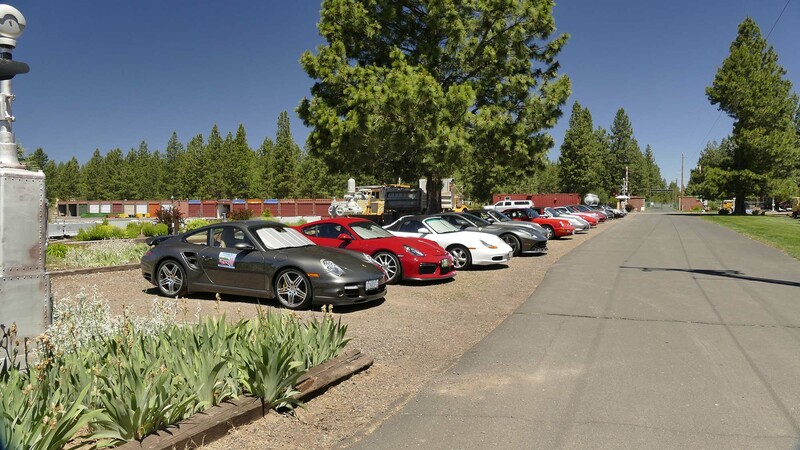 The Train Mountain Office cannot help you with a K&W event, you must contact them directly. 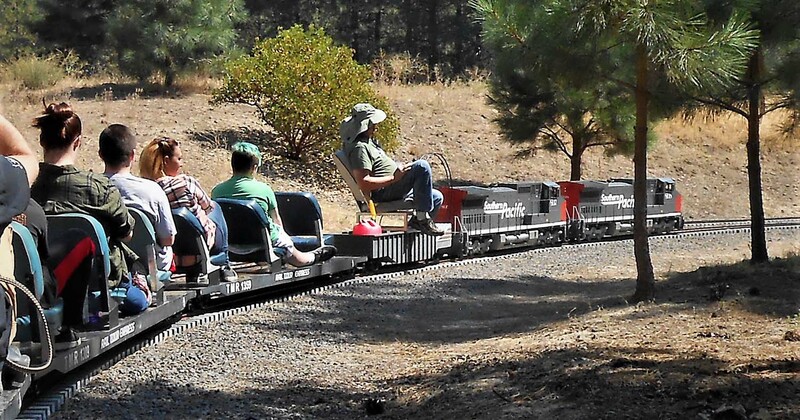 Train Mountain operates the World's longest miniature railroad, with over 37 miles of 7.5" gauge track on 2200 acres. 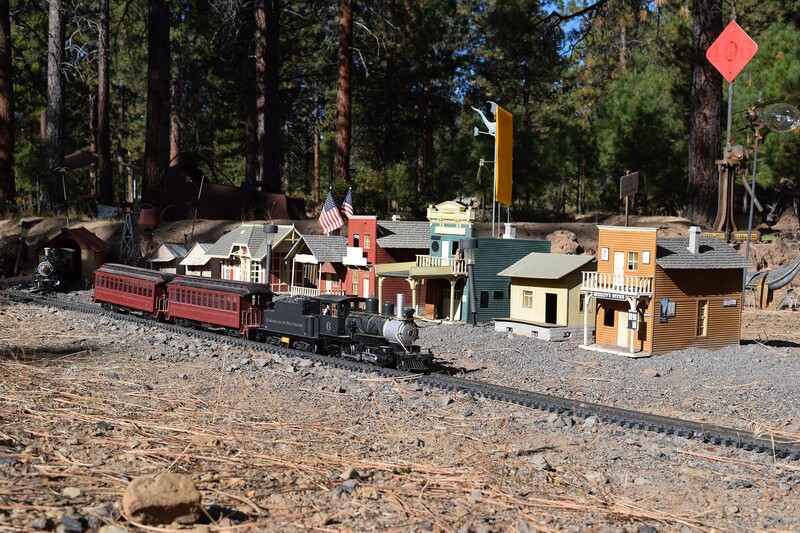 Our small trains are mostly 1/8th scale, with some of the narrow gauge models as large as 1/4 scale.